Evolution of new technologies influenced users’ culture, needs and expetiations versus products. Technological products and systems are able to protect, connect and motivate users. This thesis work focus on relation between professional disease prevention and interactive wearable systems. Here, important aspects of human behaviour were contextulize and analysed starting from its nature in order to understand if smart wearables can improve behaviour of the workers respect their health and affect regular wearing of protective equipment. In this way the nature of project is deepened and given a new sense that goes beyond the project as a basic means.The objective of the project is be to design and a plurisensorial wearable device with purpose to protect – able to detect the air quality and the health conditions of the workers. The product is equipped with a device able to alert the user of hazardous conditions and to transmit the monitored data to the mobile application. 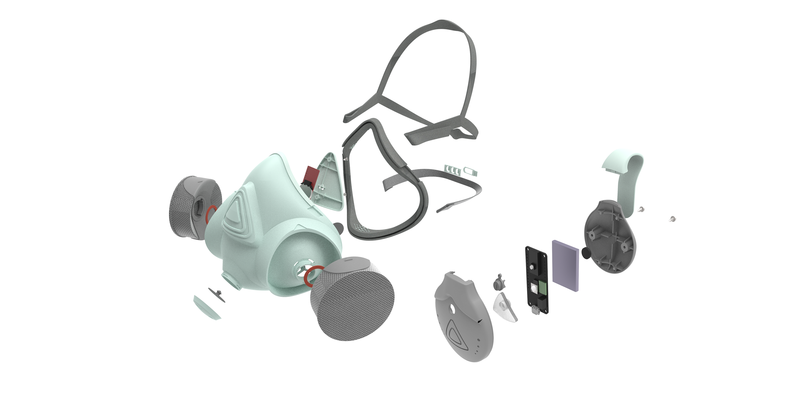 The whole system consist in three parts: Wearable Device, Protective Mask and Mobile App for employers and employees. National Patent with the title “P.O.D_ Plurisensorial Device to prevent Occupational Disease” (Patent Pending) Politecnico di Milano. Silvia Ferraris, Kaspar Jansen, Alessia Moltani, Mila Stepanovic. National Patent n.102017000055706 with the title “Electronic Nose Device for Coating Plant Environment”, Politecnico di Milano. Inventors: Venere Ferraro, Mila Stepanovic. Venere Ferraro, Silvia Ferraris, Mila Stepanovic, Persuasive Technology as key to increase Working Health Condition. The Case study of a Wearable System to prevent Respiratory Disease, 12th EAD Conference , Sapienza University of Rome, 12-14 April 2017. Venere Ferraro, Silvia Ferraris, Mila Stepanović, Wearability and User Experience through User Engagement: The Case study of a Wearable Plurisensorial Device, AHFE 2017 8th International Conference on Applied Human Factors and Ergonomics, Phase: accepted, pending. This thesis project is a part of European funded project SAFERA joint call 2014 and it is collaboration between Design Department of Politecnico di Milano, Delft University and Comftech s.r.l.